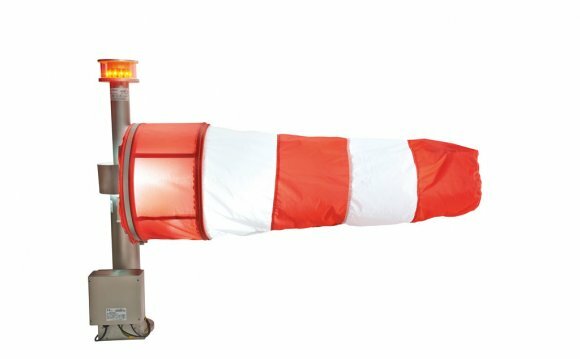 Orga Offshore, the innovative global leader in explosion proof state-of-the-art signalling products, has announced the global launch of the world’s first LED internally illuminated windsock featuring smart integrated aviation obstruction light (AOL) capability for offshore helidecks. The Orga LED illuminated windsock is designed to give pilots a clear indication of wind-speed and direction during landing and take-off in all weather conditions, day or night, and complies with UK Civil Aviation Authority (UK CAA) CAP437 Standards for Offshore Helicopter Landing Areas and International Civil Aviation Authority (ICAO) Annex 14 specifications. Using advanced optical technologies and precision engineering, the LED light source for the windsock and the AOL is fixed within the bottom of the windsock mast. Precision-cut reflective beam-shaping lens and prisms redirect light to internally illuminate the windsock, preventing floodlight glare to pilots. If an aircraft warning light is required, the AOL function can be activated without the need for additional cabling. In addition, the intelligent design of the new Orga Windsock negates the need for a complex and maintenance intensive slip ring. Using high-grade materials and cutting-edge components, a sealed unit protects sensitive electronics and excellent thermal management gives the longest possible operating life. Requiring minimum maintenance, only a periodic visual inspection is needed. Orga has a reputation for high quality safety products that are robust, reliable and durable. The company is also renowned for its expertise and knowledge of regulatory requirements in harsh and hazardous environments.